1 God stands in the congregation of God, In the midst of the gods He judges. 2 How long win ye judge injustice, And accept the persons of wicked men? Selah. 3 Right the weak and the orphan, Vindicate the afflicted and the poor. 4 Rescue the weak and needy, From the hand of the wicked deliver [them]. 5 They know not, they understand not, In darkness they walk to and fro, All the foundations of the earth totter. 6 I myself have said, Ye are gods, And sons of the Most High are ye all. 7 Surely like men shall ye die, And like one of the princes shall ye fall. 8 Arise, O God, judge the earth, For Thou, Thou shall inherit all the nations. In Psalm 1. God is represented as gathering His people together to be judged; in this psalm He has garnered them together for His judgment on judges. The former psalm begins at an earlier point of the great Cause than this one does. In it, unnamed messengers go forth to summons the nation; in this, the first verse shows us the assembled congregation, the accused, and the Divine Judge standing in "the midst" in statuesque immobility. An awe-inspiring pause intervenes, and then the silence is broken by a mighty voice of reproof and admonition (vv. 2-4). 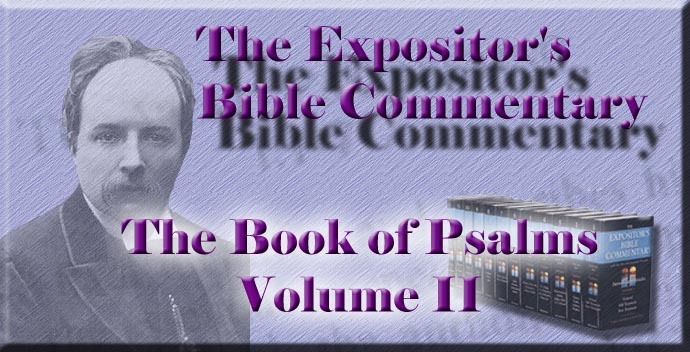 The speaker may be the psalmist, but the grand image of God as judging loses much of its solemnity and appropriateness, unless these stern rebukes and the following verses till the end of ver. 7 are regarded as His voice of judgment. Ver. 5 follows these rebukes with "an indignant aside from the Judge" (Cheyne), evoked by obstinate deafness to His words; and vv. 6, 7, pronounce the fatal sentence on the accused, who are condemned by their own refusal to hearken to Divine remonstrances. Then, in ver. 8, after a pause like that which preceded God's voice, the psalmist, who has been a silent spectator, prays that what he has heard in the inward ear, and seen with the inward eye, may be done before the nations of the world, since it all belongs to Him by right. The scene pictured in ver. 1 has been variously interpreted. "The congregation of God" is most naturally understood according to the parallel in Psalm l., and the familiar phrase "the congregation of Israel" as being the assembled nation. Its interpretation and that of the "gods" who are judged hang together. If the assembly is the nation, the persons at the bar can scarcely be other than those who have exercised injustice on the nation. If, on the other hand, the "gods" are ideal or real angelic beings, the assembly will necessarily be a heavenly one. The use of the expressions "The congregation of Jehovah" (Numb. xxvii. 17, xxxi. 16; Josh. xxii. 16, 17) and "Thy congregation" (Psalm lxxiv. 2) makes the former interpretation the more natural, and therefore exercises some influence in determining the meaning of the other disputed word. The interpretation of "gods" as angels is maintained by Hupfeld; and Bleek, followed by Cheyne, goes the fun length of regarding them as patron angels of the nations. But, as Baethgen says, "that angels should be punished with death is a thought which lies utterly beyond the Old Testament sphere of representation," and the incongruity can hardly be reckoned to be removed by Cheyne's remark, that, since angels are in other places represented as punished, "it is only a step further" to say that they are punished with death. If, however, these "gods" are earthly rulers, the question still remains whether they are Jewish or foreign judges? The latter opinion is adopted chiefly on the ground of the reference in ver. 8 to a world-embracing judicial act, which, however, by no means compels its acceptance, since it is entirely in accordance with the manner of psalmists to recognise in partial acts of Divine retribution the operation in miniature of the same Divine power, which will one day set right all wrongs, and, on occasion of the smaller manifestation of Divine righteousness, to pray for a universal judgment. There would be little propriety in summoning the national assembly to behold judgments wrought on foreign rulers, unless these alien oppressors were afflicting Israel, of which there is no sure indications in the psalm. The various expressions for the afflicted in vv. 3, 4, are taken, by the supporters of the view that the judges are foreigners, to mean the whole nation as it groaned under their oppression, but there is nothing to show that they do not rather refer to the helpless in Israel. Our Lord's reference to ver. 6 in John x. 34-38 is, by the present writer, accepted as authoritatively settling both the meaning and the ground of the remarkable name of "gods" for human judges. It does not need that we should settle the mystery of His emptying Himself, or trace the limits of His human knowledge, in order to be sure that He spoke truth with authority, when He spoke on such a subject as His own Divine nature, and the analogies and contrasts between it and the highest human authorities. His whole argument is worthless, unless the "gods" in the psalm are men. He tells us why that august title is applied to them--namely, because to them "the word of God came." They were recipients of a Divine word, constituting them in their office; and, in so far as they discharged its duties, their decrees were God's word ministered by them. That is especially true in a theocratic state such as Israel, where the rulers are, in a direct way, God's vicegerents, clothed by Him with delegated authority, which they exercise under His control. But it is also true about all who are set in similar positions elsewhere. The office is sacred, whatever its holders are. The contents of the psalm need little remark. In vv. 2-4 God speaks in stern upbraiding and command. The abrupt pealing forth of the Divine Voice, without any statement of who speaks, is extremely dramatic and impressive. The judgment hall is filled with a hushed crowd. No herald is needed to proclaim silence. Strained expectance sits on every ear. Then the silence is broken. These authoritative accents can come but from one speaker. The crimes rebuked are those to which rulers, in such a state of society as was in Israel, are especially prone, and such as must have been well-nigh universal at the time of the psalmist. They were no imaginary evils against which these sharp arrows were launched. These princes were like those gibbeted for ever in Isa. 1.--loving gifts and following after rewards, murderers rather than judges, and fitter to be "rulers of Sodom" than of God's city. They had prostituted their office by injustice, had favoured the rich and neglected the poor, had been deaf to the cry of the helpless, had steeled their hearts against the miseries of the afflicted, and left them to perish in the gripe of the wicked. Such is the indictment. Does it sound applicable to angels? For a moment the Divine Voice pauses. Will its tones reach any consciences? No. There is no sign of contrition among the judges, who are thus solemnly being judged. Therefore God speaks again, as if wondering, grieved, and indignant "at the blindness of their hearts," as His Son was when His words met the same reception from the same class. Ver. 5 might almost be called a Divine lament over human impenitence, ere the Voice swells into the fatal sentence. One remembers Christ's tears, as He looked across the valley to the city glittering in the morning sun. His tears did not hinder His pronouncing its doom; nor did His pronouncing its doom hinder His tears. These judges were without knowledge. They walked in darkness, because they walked in selfishness, and never thought of God's judgment. Their gait was insolent, as the form of the word "walk to and fro" implies. And, since they who were set to be God's representatives on earth, and to show some gleam of His justice and compassion, were ministers of injustice and vicegerents of evil, fostering what they should have crushed, and crushing whom they should have fostered, the foundations of society were shaken, and, unless these were swept away, it would be dissolved into chaos. Therefore the sentence must fall, as it does in vv. 6, 7. The grant of dignity is withdrawn. They are stripped of their honours, as a soldier of his uniform before he is driven from his corps. The judge's robe, which they have smirched, is plucked off their shoulders, and they stand as common men.